Cloud Database is more and being in use now than before. The question of migrating from relational database model to NoSQL Database is becoming more important. 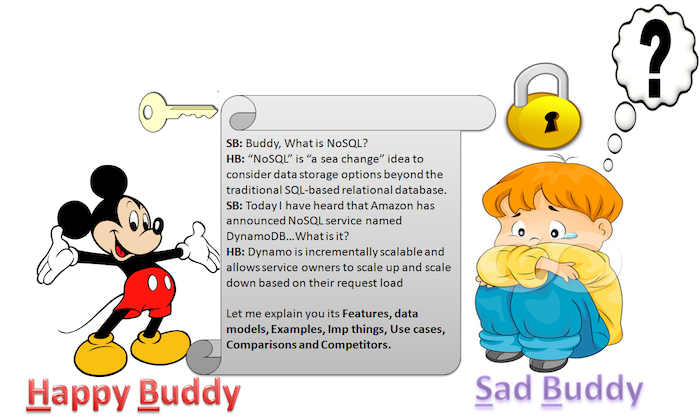 The related topics are a basic article on Cloud Database, article on NoSQL. As the pricing of Cloud Database is hourly or as per usage basis, the experimentation with database has been easier. Digital data found in more and more areas of life today and the largest area is obviously the World Wide Web. Since the launch of Web 2.0 and its opportunities has been found increasingly, the content is delivered not only primarily by the respective website owners or companies, but everyone has the ability, content in the form of blogs, wikis, Google Plus communities, micro-blogs, forums, portals and social media networks actively plays a big role. With currently nearly 1000 million active users per month for Facebook very clearly states that participatory society is just growing and growing and constantly providing new data. The burden of 2 zettabytes of data in relation to current world population of nearly 7 billion which makes it equivalent to 283 gigabytes of data per person. Next to the permanent growing data volumes, there is the demand in regards to the availability of the digital data. Over the next seven years, by 2020, this will increase at least to tenfold, which is expected to increase the infrastructure by a factor of 50, which must be managed efficiently. Therefore, ways need for storage and information management are found, to keep pace with the increasing demands of step. First, the problem must be clearly defined. Based on these figures researched the varied range of databases. Many DBMS can be excluded because of their fundamental properties and thus can be found after many test set of architectures, which have some potential. These architectures are examined for their advantages and disadvantages. On the basis of the decision on the architecture, the products must be investigated. In general, one can choose the standard products. The selection of a product is carried out on the basis of a feature matrix which is structured in accordance with criteria of the problem. This matrix is the means to the should not do without. It is divided into different categories and these categories are provided with weights. Depending on the degree of fulfillment of a criterion the product with the highest score is selected. The vertical scale is the most popular and also the easiest to be implemented for scaling, Largely, it is based on the use of more powerful components. Vertically scaled systems are easier to maintain, since no interdependencies with other systems exist. Existing applications must not be rewritten, but can be used as before. Because vertically scaled systems are monolithic, there is less risk for consistency problems. For the horizontal scaling, in contrast to the vertical, is aimed with no qualitative improvement in performance, but a quantitative one. Strikingly expressed, one can say that here instead of a large powerful computer, several less powerful computers are used. Through the use of horizontal scaling, it is also possible to realize an efficient regionalization. In the era of globalization services, we have now spread data worldwide. In order for the geographically dispersed users database can be served reliably and with minimal latency. This Article Has Been Shared 5211 Times! Cite this article as: Abhishek Ghosh, "Cloud Database : Migrating From Relational Database Model to NoSQL," in The Customize Windows, January 2, 2013, April 26, 2019, https://thecustomizewindows.com/2013/01/cloud-database-migrating-from-relational-database-model-to-nosql/.